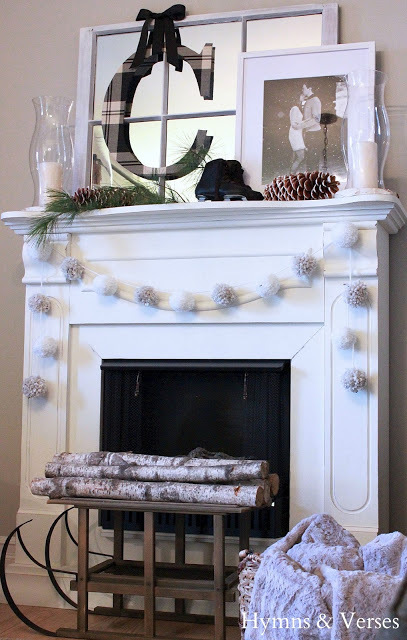 Last year I made this a pom pom garland for my fireplace mantel and you loved it! I did too, so much so that I used it again this year for my winter mantel. It’s a fun and easy project that you can use for any season, depending on the color yarn you use. I like pom poms in the winter because they remind me of snowballs. The colors I chose for my yarn are based on that. I got both at Walmart, but unfortunately, I no longer have the wrappers for either skein. The most important thing you want to keep in mind when choosing yarn for a pom pom is the size and texture of your yarn. The thicker the yarn the better! 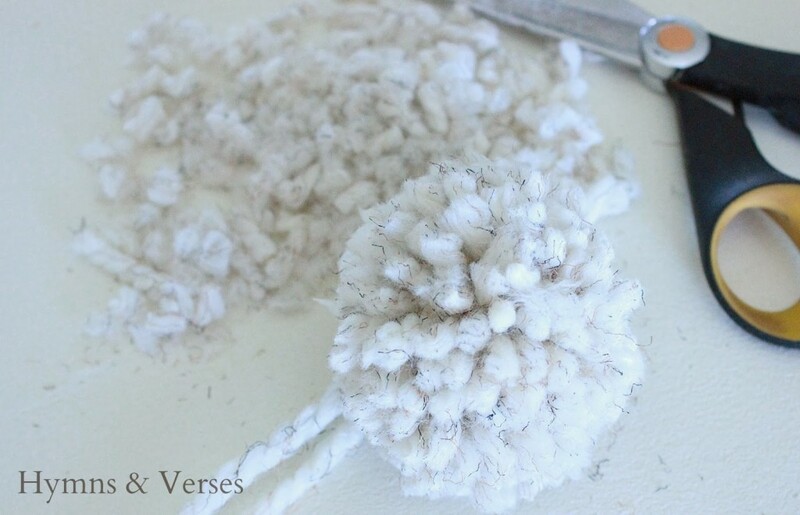 There are several methods and tools to make a pom pom, but here’s how I make mine. The only thing you need is yarn and a pair of scissors. Cut a piece of yarn about 8 inches long and set aside. In your left hand, drape the end of your yarn (attached to the skein) over three or four of your fingers (the more fingers, the larger the size pom pom). I usually use four fingers. 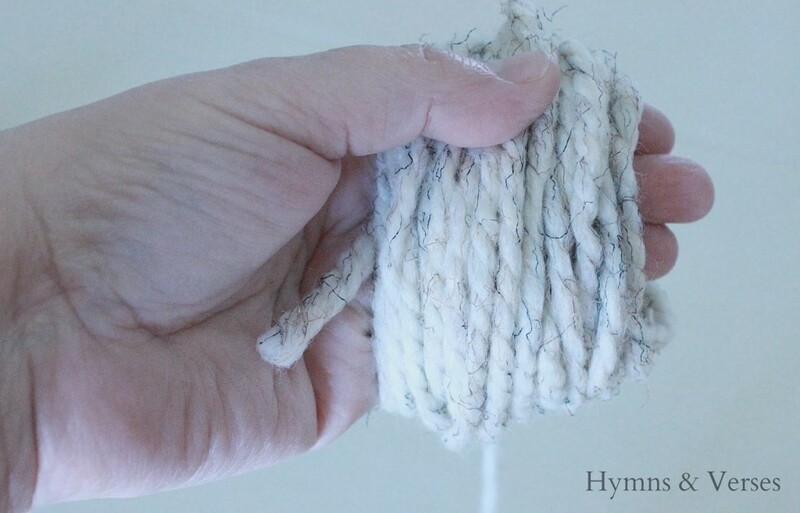 Hold the end of your yarn with your thumb. 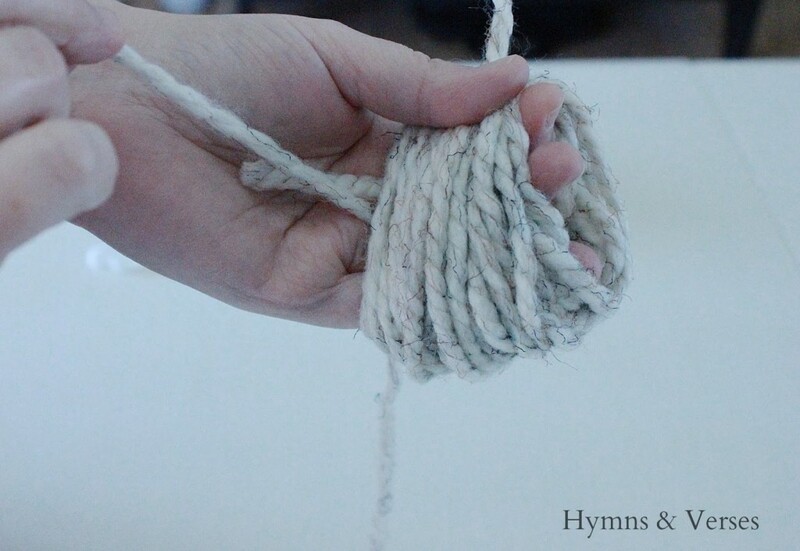 Now wrap your yarn around those four fingers fifty times – not too tight. 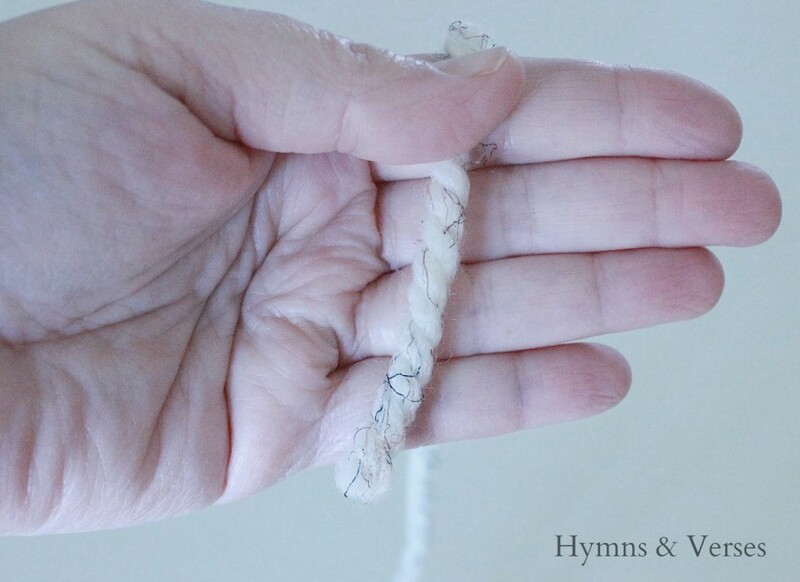 Cut your yarn so that you can hold the end with your thumb. 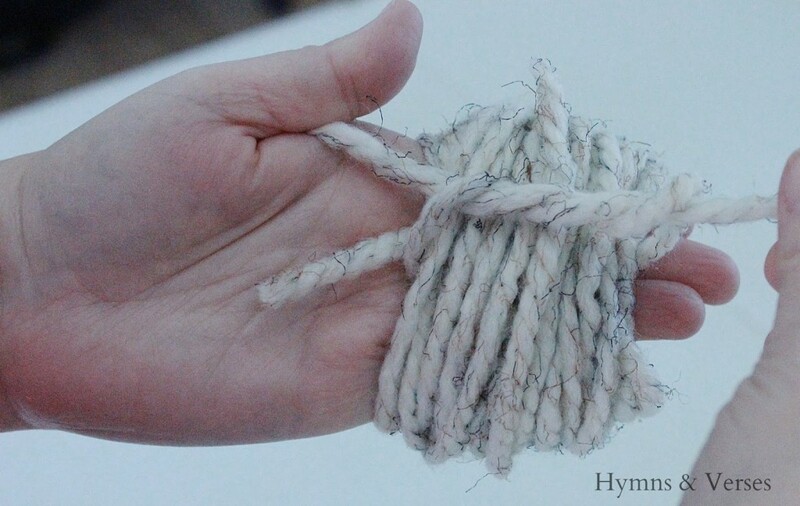 Now take the 8 inch piece of yarn that you cut earlier and push I end down through your two middle fingers (closest to your hand). I use the end of my scissors to get it started. Once you can reach it on the palm side of your hand, pull the end through. Now, take that end and bring it up and through the same two middle fingers near your fingertips. 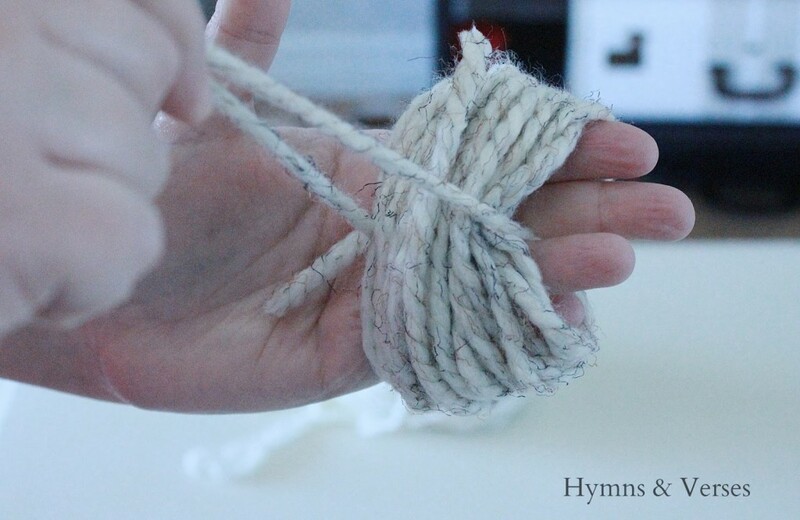 Remove the tied yarn from your hands and tie once more to make a knot. 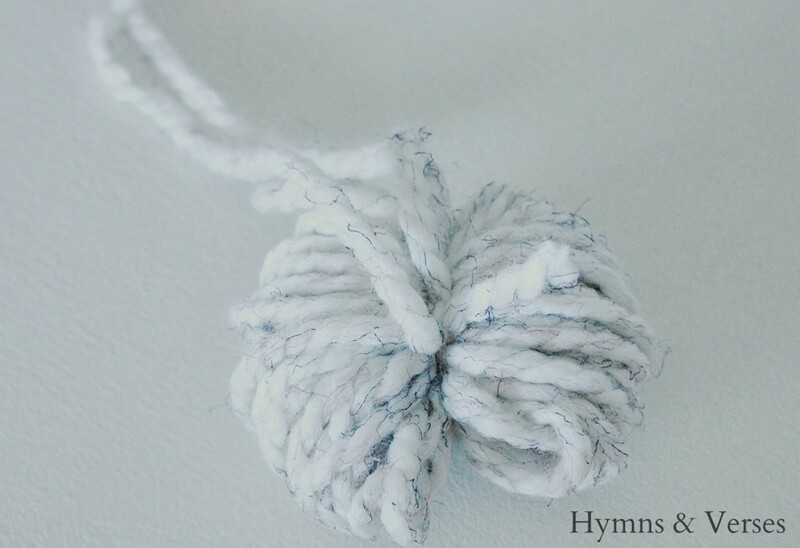 Do NOT cut the ends of the yarn that you used to make the knot. You will need this to hold onto your pom pom in the next step. Now, using your scissors, cut through the loops made on both sides. You will end up with a rough looking pom pom like this. Now, here’s my favorite part – give your pom pom a haircut! 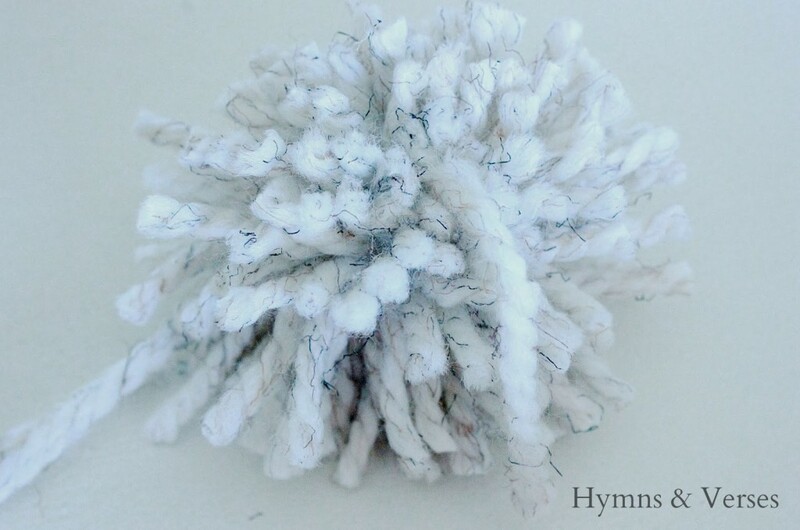 Cut off the ends and shape your pom pom into a nice, round ball! I usually end up cutting off between 1/2 to 3/4 inch all the way around. It really depends on what size and how well formed you want your pom pom. 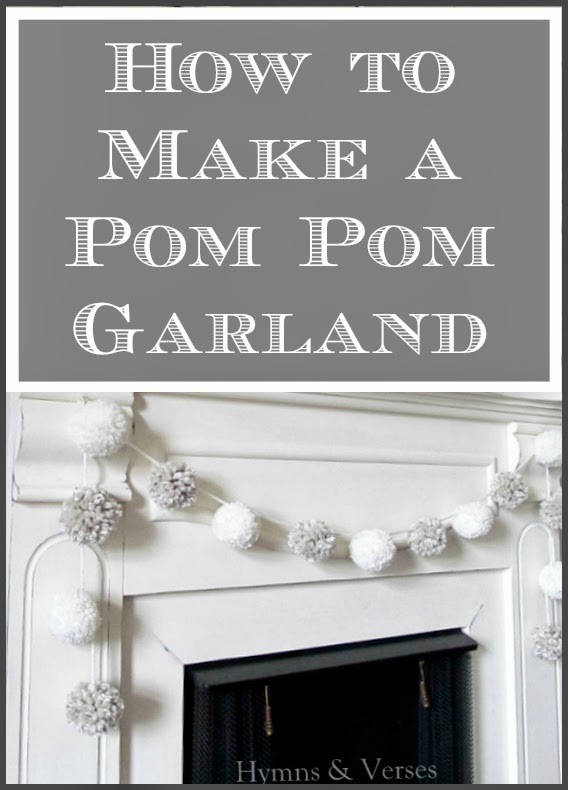 Make as many pom poms as you need for your garland. I used two kinds of yarn and alternated the colors in my pom pom garland. 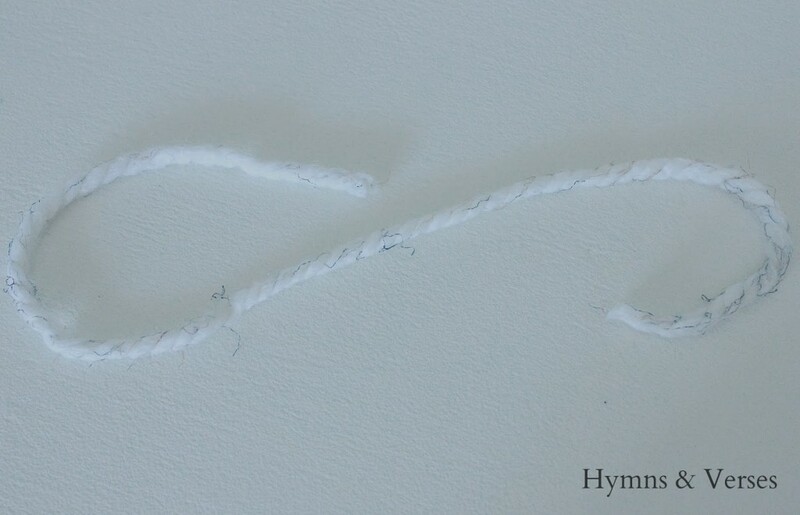 Cut another piece of yarn the length you need for where your garland will go. 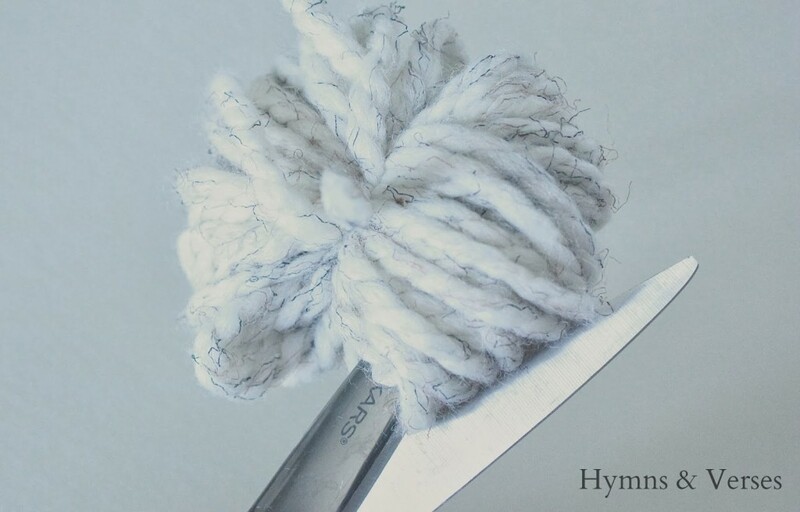 Now, just tie your pom pom to this piece and trim the yarn ends that you have been using to hold your pom pom so they blend in with the rest of the pom pom. 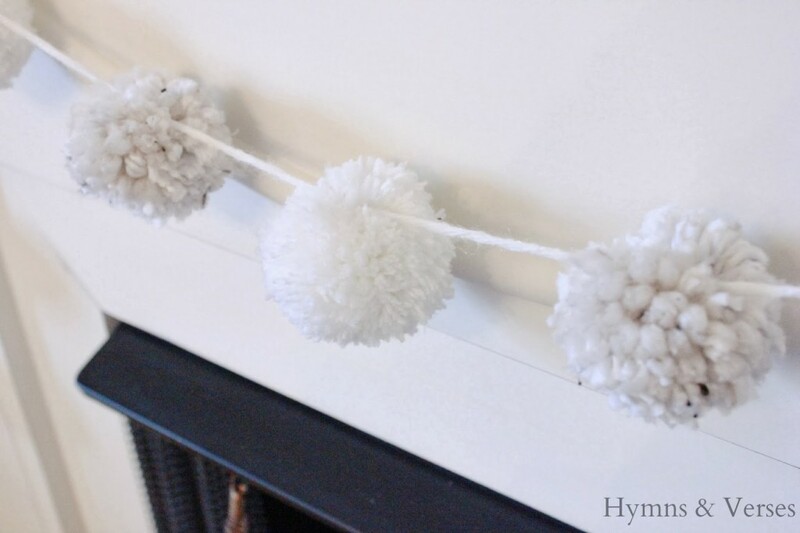 Space the pom poms equally along your length of garland. 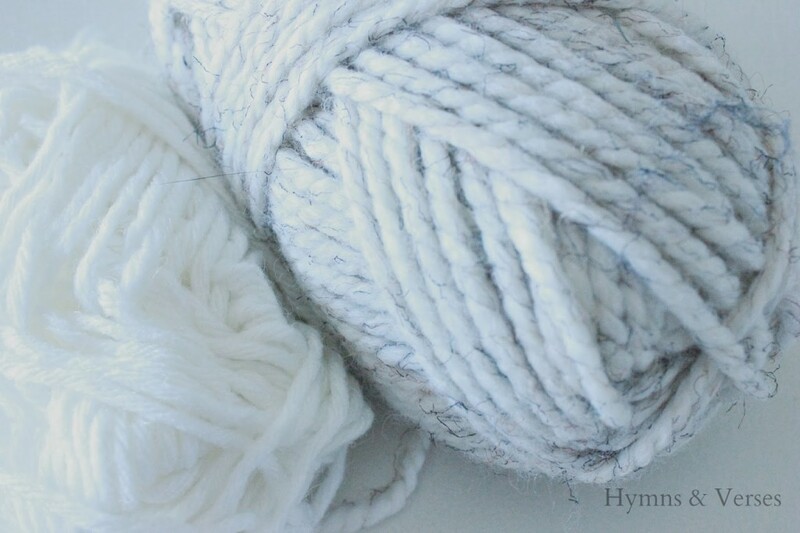 For the ends, trim the garland yarn piece to blend in with the rest of the end pom pom. 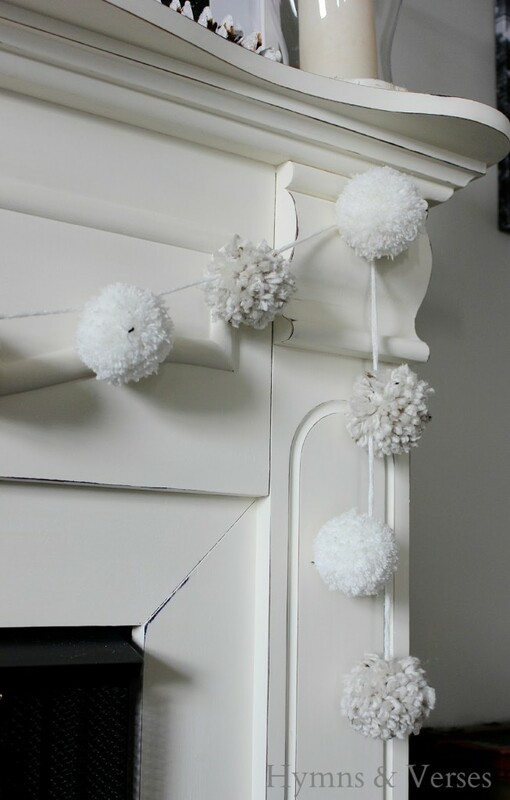 That’s it – you have a pom pom garland – a simple and fun project, perfect for a cold winter evening that you can do while you watch TV! I hope you have a wonderful weekend – now go get some yarn and make a pom pom! 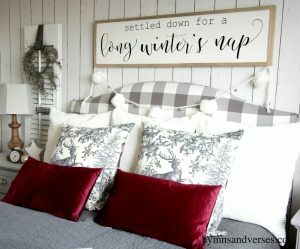 I’ve used pom pom garlands in my decor a lot through the years. You can see some of those spaces in these posts. So cute! Thanks for the tutorial! It looks fun to make! Doreen these are just adorable! 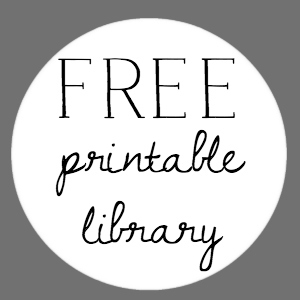 I will for sure be making some, and I think my kids would love to help too! Way fun!! Thanks! 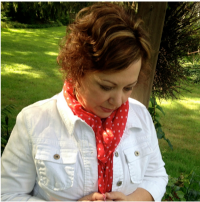 Great tutorial Doreen…I love that garland! The pom pom swag is wonderful. I can see this in pink and hot pink or red and white for Valentine's Day and other colors for other holidays. Thanks so much for sharing the tutorial! Adorable! 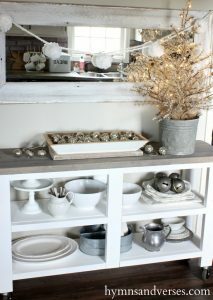 Love the mirror in the old window, really makes for a great presentation. 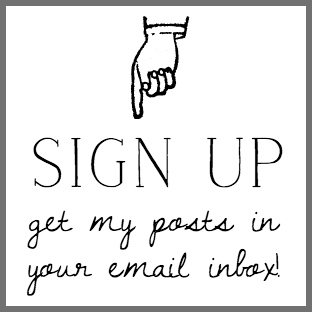 I can't wait to make pom poms for something…. Ok now that is amazing! I love how puffy and pretty each pom pom is. 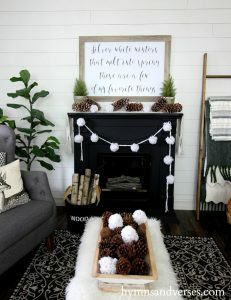 And it's just the perfect accent for you mantel's winter decor. I am CRAZY about pom poms!! Thanks for the tutorial, Doreen. I love the subtle mix of colors. PS You need to give workshops!